Fall Collecting Trip #6: Hogfish and Morays and Trunkfish, oh my! Today was our first full day of collecting and everyone did a great job! Our first dive site was at Great Heads, a sandy reef that runs along a long rocky outcropping. We saw a beautiful Southern stingray on the sandy bottom surrounded by yellowhead jawfish poking their heads out of the sand. There was a significant current which made the dive slightly challenging – once you got around to the right position to hover with your nets, you got swept down into your partner! At the end of every dive, on the way back to the boat, we clip our collection bags to a barrel that is floating about halfway between the boat and the sea floor. Fish are very sensitive to changes in pressure and so they have to be brought up from depth very slowly. From the surface, we can raise the barrel five feet every five minutes until they reach the surface. Once at the surface, it is a mad dash to identify everything and put it in its temporary home aboard the boat. I caught another sharpnose puffer – a more robust specimen – that is now one of our well-cared-for residents aboard the R/V Coral Reef II. I was most proud of another catch though: Sam and I caught a smooth trunkfish about the size of a NERF football! Sam and Sarah caught a goldentail moray, to everyone's delight! Other highlights included a trumpetfish, French grunts, and even two juvenile Spanish hogfish (one who had been masquerading as a fairy basslet). All in all, a very successful day! After a queasy crossing from Miami to Bimini and some time for my stomach to settle, we went for the first of what I hope to be 20+ dives. The location was Bimini Road--a shallow dive for everyone to check out their gear and get comfortable in the water. It was a short dive of just about a half hour, but in that brief time I was lucky enough to see lots of our targeted collecting fishes along with a Southern sting ray and the first shark of the trip- a Nurse shark about 6’ long. I have been diving a few years, but only in Massachusetts waters and the GOT--this little dive was by the far the best of my life! After a short surface interval and tank change, we went back in for our first collecting dive. My partners were Sam Benton of NEAQ, and Suzanne Rose, a veteran of several collecting trips and NEAQ volunteer. Those two were fantastic! We seemed to click as a team right away and were fortunate to collect nine keepers. Among the species were Bluehead wrasse, Slippery dicks, Foureye butterflyfish, sharpnose puffer and a parrot fish. That dive then replaced the first check-out dive as my best dive ever. That’s all for now...more to follow. Jim geared up for a dive! I am not what you'd call and adventurous sort, however, after someone had to cancel from this trip, the opening was presented to me. Of course I'd go!! Preparations were made; I bought a wetsuit, booties, mask, fins and a snorkel, rented the rest of the equipment and became certified as a SCUBA diver. As the date neared, a little nervousness set in...okay, maybe a little more than a little nervousness. Perseverance, I told myself, and I was right. What a great group of fun, knowledgeable and supportive people. Front to back: Jill, her sister Sarah and her step-daughter - our trip leader - Sarah Taylor! The first dive was my first real dive; I'd only been in a swimming pool and a quarry for my SCUBA course. This was the ocean. Stepping off the dive platform at the back of the Research Vessel Coral Reef II, gently descending to the bottom...and another whole part of the planet we live on is right in front of me. Fish just going about their daily business, seemingly unaware of my presence. I'm in their world, and it's beautiful! Fall Collecting Trip #5: Bimini Bound! At 5:30 this morning we were woken up by the sound of the engines roaring to life. I quickly grabbed my flip flops and went up on deck. Bill was casting off the last line and we were underway! We sat up in front of the bridge on a small lip for the entire length of our journey out of the Miami River and it was INCREDIBLE! It was still dark outside, and there was not much activity in the city, but we were treated to a view that few people ever get to see. The water was still and dark, we even had to wake up one of the drawbridge operators by sounding our horn and shining a spotlight into the guard station! Once we exited the mouth of the river, the water was very choppy and there was a good amount of sea spray. I decided that a motion-sickness-pill-induced nap was in order, and slept for most of the rest of the crossing. When I awoke again, we were pulling into Bimini! Brightly colored condos and hotels and water the color of jade. Captain John took our passports in to clear customs, and once he returned, we were off to our first dive site – Bimini Road. The first dive was a short check out dive, just to get everyone comfortable setting up gear and getting in the water, and used to any gear that is new (or new to them!). 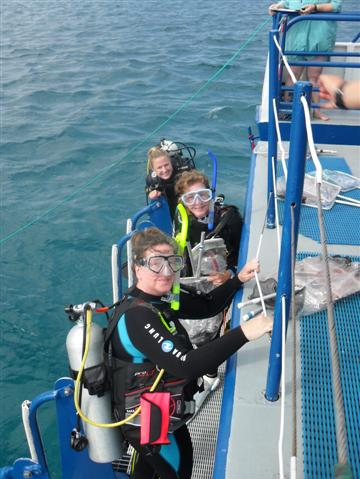 I dove with Bill and although the water was super choppy up top, once you get below it was calm and clear. We took a short swim around the rocks – the site is called Bimini Road because there are a stones arranged on the sea floor that look like they might have once comprised a street. After a quick meeting on deck to swap out tanks and talk about the goals for collecting, we were back in – this time with a mission: collect fish! 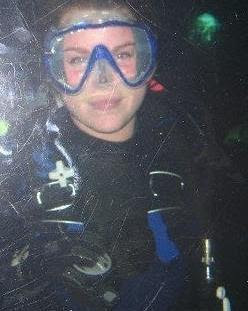 Sarah wanted the staff to do the first dive together so her, Bill, Dave and I went in as a group. Sarah was intent on catching a juvenile blue tang and we spent most of the dive patiently trying to coax him into our nets. We succeeded, and other catches from the first day included foureye butterflyfish, little parrot fish and I even caught a tiny sharpnose puffer. I had to release him though, because of his small size, but it was a wonderful feeling to have caught something on my first collecting dive! The Aquarium is very selective in which fish we are able to keep, first they must be on our list of animals that have been requested by aquarists back in Boston. We never collect any animals that are threatened or endangered, and we never take anything that has eggs (shrimp or crabs), and we never take anything too small to survive transportation back to Boston. I am exhausted but in a very good way, and tomorrow we have even more excitement in store! As always – more to come!! #78: What's Happening - Fish Fun Fright! As you anxiously await the next blog entry from the Bahamas, enjoy these pictures of Fish, Fun & Fright! night, our annual Halloween party just for members here at the Aquarium. Like we do every year, we donned costumes and jumped right in our center exhibit, the Giant Ocean Tank. There were even jack-o'-lanterns inside the GOT! A small-headed Spongebob (Ryan) and Medusa (Jason), thumbs up! Myrtle, our 550-pound green sea turtle, always finds a way to get in the picture. Maybe she recognizes reptiles (the snakes on his head) when she sees them. Wait, is that a sushi chef with a pumpkin in his lap? What a fun night! Thanks to Daire for taking all these fantastic photos. Can't get enough of scuba divers in Halloween costumes, check out previous years' posts here, here and here for photos and, yes, underwater video of spacemen, Ghost Busters, pirates and bees! I am sitting here enjoying a fresh baked oatmeal raisin cookie at the end of three long, wonderful days. All of our participants arrived today and everything is ready for our departure early tomorrow morning. We will leave the dock at 6 a.m., head down the Miami River, and cross the Gulf Stream arriving in Bimini around noon. I am really looking forward to getting out on the water. I've got to admit, the picture of the boat posted earlier was from a past trip, when they were already out of Miami. The picture below is of the boatyard where we are actually moored, as well as the view from deck. The R/V Coral Reef II docked in Miami, before our voyage to the Bahamas. Tonight after dinner, Sarah talked to us all about logistics of the trip. She and Dave showed us proper collecting techniques, and talked to us about what to expect and how to cope with the inevitable disappointment of coming back from a dive empty handed. Captain John addressed the group after Sarah to talk about boat safety and life aboard the boat. Sarah and Dave demonstrate collecting techniques. Although everyone is sleepy, either from traveling or prepping the boat, there is palpable excitement amongst the inhabitants of the RV Coral Reef II. We are all really looking forward to getting out on the water tomorrow! However, there is one small piece of bad news tonight – the satellite hub that would have enabled me to stay connected at sea did not arrive in time for our departure. That means that I will not be able to post updates until we return to Miami on October 28. I realize that I you are all hanging on my every word in these posts, but while you are waiting, I really encourage you to check out the other active blogs on the site – the New England Aquarium always has something going on! We spent today doing more work to get the boat ready for our journey. The big project of the day was to replace the sediment in the sand filter. There are three main types of filtration in aquariums: chemical, mechanical and biological. A sand filter is a natural mechanical filter; water flows from the tanks into the chamber and through the sand where dirt and waste get trapped. Then clean water flows out the other end and back into the tanks. While Dave, Bill and Sarah (the aquarists on board) were busy with the filter, Sam and I spent the majority of the day fixing the collection nets/bags. We use dental floss to fix holes in the net so that we don't lose the fish that we will work so hard to find! Fixing the gear is a time honored tradition on these trips, and there is always more to be done! Once the filtration system had been cleaned out, we stared cleaning the boat: scrubbing the holding tanks and the decks, as well as further organizing the gear. Dave even set up his brine tank (tiny brine shrimp are a tasty treat for our fish). Tonight we are taking a little break after a delicious supper of vegetarian lasagna, courtesy of our steward, Orvis. The trip participants arrive tomorrow, and there is still a good amount of work to do in the morning before they come! Fall Collecting Trip #2: Welcome to Miami! After a dubious start to the day in the form of giant lines at the airport, we made our flight and made good time to sunny Florida! Once we arrived, it was a quick drive (with a little detour) to the boat yard where the RV Coral Reef II -- our home for the next two-plus weeks -- was waiting for us. Today consisted of a lot of prep work, mainly unpacking the gear we had shipped down, going through boxes and organizing all of the stuff that makes this trip happen smoothly. There's everything from dive gear and collection bags, to construction material like extra netting, and other odds and ends. The other major project of the day was to prepare the habitat for the fish that we will be collecting during our time here. The RV Coral Reef is a really interesting vehicle in that it is not only equipped to transport people during these trips, but also the fish that we collect along the way! The back of the ship is modified to have four large holding tanks sunk into the floor. There are also two "itty bitties", or smaller tanks raised on the sides. Still more tanks line the sides of the vessel. The tanks are all connected to a very cool filtration setup, also located in the back part of the ship. Just like a normal aquarium setup, this system circulates water in the tanks through filters to keep the water clean. This system is special because, once we are out to sea, it can use the water from the ocean, in what is called an open system. The fish are already used to the water, so it's one less thing that the aquarists have to worry about. When we come back into the Miami River we can close the system and re-circulate the Bahamian water. 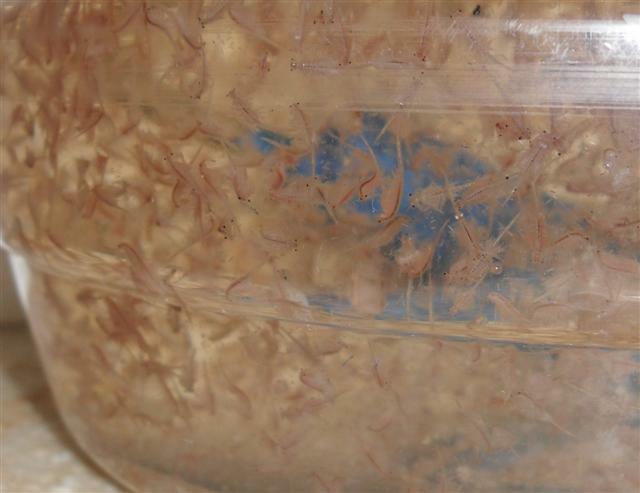 Another way we can reduce stress on the fish is to provide them with "habitat" in the holding tanks. This can be anything from gravel to line the bottom of the tanks, to PVC pipe cut into shapes that mimic hiding spaces. We are cleaning the system and all of the habitat tonight, so that it will be ready to fill with fresh clean water when we start collecting! Some of the large holding tanks filled with "habitat"
My bunk: Home sweet home! That's all for tonight, lots more prep work tomorrow. Stay tuned! Well, it's almost time! I am headed down to Miami early tomorrow morning for the beginning of the New England Aquarium's Fall Collecting Expedition. I feel like the trip came up on me very fast. It seems like just last week when I was called into my boss Deb's office to hear the amazing news: I had been chosen to go as staff on the trip! I was almost in shock, what an unbelievable opportunity. As I sat dazed in her office, Deb shared the details of the trip, as well as some of her personal advice (she is a veteran of sorts, having been on two past trips in the spring of 2009 and 2010). She explained that we will be living aboard the RV Coral Reef II in the warm tropical waters off the island of Bimini in the Bahamas! She said that my primary job as staff on the trip will be to help collect specimens for use on exhibit at the Aquarium (which we are able to accomplish with the consent of the Bahamian Government, we never take any fish on the IUCN Red List), but my other main task will be to document our trip on the Aquarium's blog. That was in August. Now, a bunch of meetings, loads of prep work and even some dives in the Giant Ocean Tank later, I am suddenly here the night before the trip finishing my very first blog entry! I am off to finish packing, but stay tuned for more updates.